Today, India still remains a rural agricultural country although the share of urban population has also increased but these figures do not tell the whole story. There are evidences that urban growth is dispersed and urban sprawl promotes the spread of urban land use into the rural-urban fringe. From the Contents: What is urban and what is rural?.- Outside the city boundaries: the areas surrounding urban centers.- Methodology and Data Sources.-Conceptualizing Peri-Urban interface.- Peri-Urban Interactions.- The Study Area.- Land in Aligarhs Pui.- Factors Influencing Land Transformation.- Actors and Their Role in Pui Land Transformation. 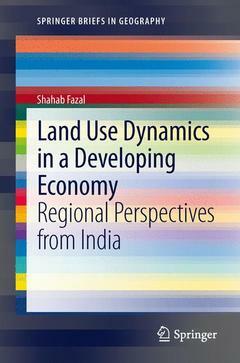 Dr. Shahab Fazal is Associate Professor at the Department of Geography in Aligarh Muslim University. Dr. Fazal is an active researcher and availed several international fellowships like DST-DAAD Fellowship (2000-2001), Commonwealth Fellowship (2004) and Shastri Fellowship (2003 & 2009). Currently he is leading an international research project in collaboration with Montreal University and McGill University, Canada. He has published 10 books and 45 research articles in various national and international journals of repute. He recently has been awarded a prestigious Research Fellowship by Netherland Academy of Science (NWO), Government of Netherland. Dr. Fazal is conducting research on Livelihood Transformations in the urban Fringe of Netherlands Cities. He is affiliated with Faculty of Geosciences, Utrecht University as Visiting Professor. Gives a new approach of the study of land transformation in peri-urban interfaces. Show the urban population movements over decades in small north Indian cities and the implication of these movements.